Life Ok has already launched many New Tv Show in this year . Last released show of Life Ok is 'Kalash' . 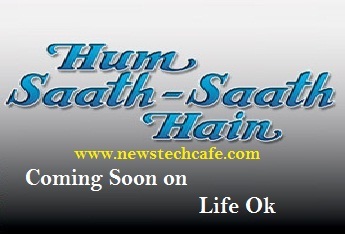 Now Life Ok is Planning to Launch a New Family Show which is tentatively titled as "Hum Saath Saath Hai" .This new tv serial is produced by Ravi Ojha. The official trailer and timing information is not revealed by Life Ok.
Hum Saath Saath Hai Tv Show story is seems to be very interesting. The show story based on a Horror house in Goa . The story is revolving around a Rich man and his young daughter. The man story starts when the girl falls in the love of a boy who lived in that Haunted House. Her father don't like that boy . So the story is mainly the love story of Rich man Daughter who start loving the boy living in Haunted House. Official promo of this new television show is not yet revealed by Life Ok. Stay tuned with us to watch the promo of this show. But we are sharing a Popular bollywood song whose lyrics starts from "Hum Saath Saath hai." This show will be starts from July,2015 only on Life Ok Channel.